In ancient Greek mythology, Chimera was a hybrid creature merging goat, lion, and snake body parts into a new whole. Today, Chimera is a term that describes a single organism with multiple, genetically-distinct cell lines. From bacteria and viruses in vaccines, horse urine in some birth control and hormone therapies, and the possibilities of pig and primate organ transplants, human and animal bodies are increasingly integrated in medical, pharmaceutical, and biotechnological realms. 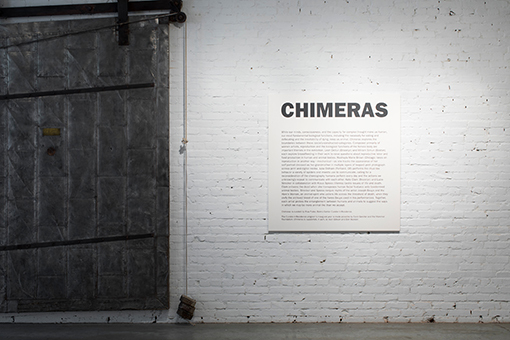 Chimeras is a group exhibition that explores the boundaries between these socially-constructed categories. But what qualities define who is human and what is animal? While our minds, consciousness, and a capacity for complex thought makes humans human, our most fundamental biological functions, including the necessity of eating and defecating and the inevitability of dying, keeps us animal. Composed primarily of women artists, reproduction and the biological functions of the female body are important themes in Chimeras. Brooklyn-based Leah DeVun's photographs feature breastfeeding women wearing a variety of milk-pumping apparatus that make them appear animal-like while acknowledging how technological interventions in “natural” bodily functions are often necessary. Miriam Simun also enlisted the collaboration of breastfeeding mothers. Simun used donated breast milk to make cheese and offered samples at an art gallery she transformed into The Lady Cheese Shop. A video and diagram detail the production cycle for making Human Cheese while raising questions about food production, reproductive labor, and the commodification of human and animal bodies. Chicago’s Rashayla Marie Brown addresses reproduction from a different angle: mechanical and digital. Her photograph You Can't See Me Fool is a self-portrait of the artist as her grandmother dressed in multiple layers of leopard print. The image quickly “went viral” and is frequently reproduced in print and online media. For Chimeras, Brown compiles the archive of her photograph’s many lives, in a sense, recapturing this fugitive and wild image. Julia Oldham of Portland, Oregon performs the ritual-like behavior spiders and insects use to communicate. 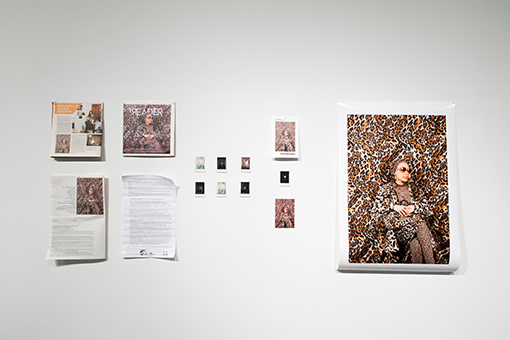 The bugs provide the soundtrack for Oldham’s intricate dance-like movements, which call for a reconsideration of the choreography humans unknowingly repeat everyday to communicate with each other. Lucie Strecker and Klaus Spiess, who collaborate in Vienna, approach questions of life and death through the work of Joseph Beuys. The late German artist often used the hare as a spiritual medium that transgresses planes of existence, notions rooted in European folktales of the Hare’s Woman. Stecker and Spiess vivify the archived blood of one of Beuys’s hares and keep the cells alive via a cooling system that sets a different biological time into motion. 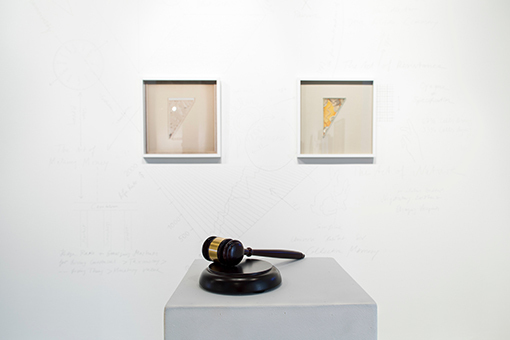 The actions occurring within the petri dish function as a performance with the growth rate of the cells timed to the auction values of Beuys's artwork and the trading value of livestock on the New York stock exchange. Brooklyn-based Kate Clark also enlivens the dead when she transposes human facial features onto taxidermied animal bodies. Each pair of animals enact a different relational dynamic. 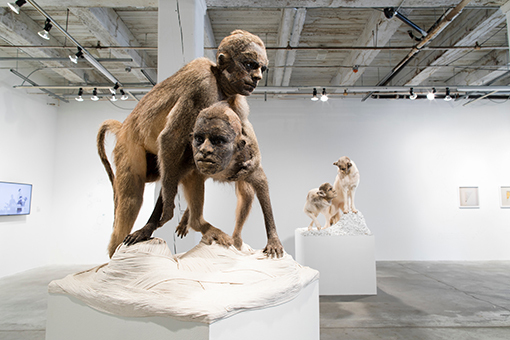 Clark’s sculptures embody the ways in which human characteristics are projected onto animals, but, like all of the work in the exhibition, equally suggests how humans are more animal-like than we accept. 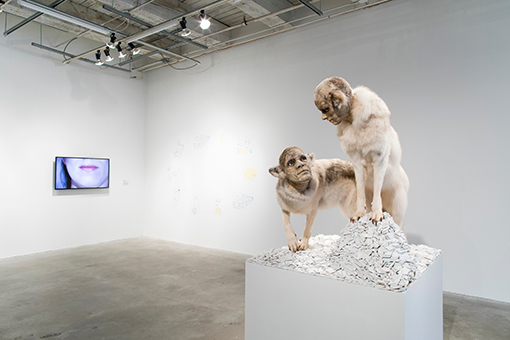 Chimeras is curated by Risa Puleo, Bemis Center Curator-in-Residence. The Curator-in-Residence program's inaugural year is made possible by Carol Gendler and the Mammel Foundation. Chimeras is supported, in part, by Joan Gibson and Don Wurster. Additional support is provided by Melanie and Fred Clark and Catherine and Terry Ferguson.